Panna cotta means cooked cream in Italian, a dessert made by simmering cream, milk and sugar then mixing it with gelatine and cooled down to set. Usually served with wild berries, caramel, chocolate sauce or fruit coulis this Italian dessert is one of the easiest desserts to make. Originally from a place called Piedmont located in Northern Italy, early versions used boiled fish bones in place of gelatine, it was consumed plain, with hazelnuts or with fruits then it evolved into what is now the popular gelatine dessert. Thanks to the person who invented commercial gelatine otherwise I am not sure whether I will enjoy this treat, I am just unsure about a dessert where it is made out of home boiled fish bone collagen and cream. Well if you come to think of it gelatine comes from bones of animals anyways. In a bowl mix together milk and gelatine, set aside. In a saucepan mix together cream and sugar, place in stove top bring it to a boil then lower to simmering heat. Pour milk mixture over into the sauce pan then give it a good mix then turn heat off. Pour into 6 small ramekin dishes or dessert glass then let it cool, refrigerate until set. In a blender mix all Berry Toppings ingredients together except for blueberries and cornstarch. Pour blended mixture in a sauce pan and bring it to a boil, simmer for 5 minutes then add the cornstarch mixture. Continue to simmer until berry sauce thickens. Remove sauce from heat then let it cool, once cooled down pour on top of set panna cotta then top it with blueberries, refrigerate for 3 more hours before serving. Wow! Gorgeous photography and delicious looking panna cotta! Athough I’m used to a wobbly panna cotta outside of its mould, I think yours look delicious especially with that layer of berries. Panna Cotta – Yum yum!!!! It’s so beautifully delicious looking with the little layer of berries. Gorgeous photo! Look how beautifully done those are Raymund! I’d feel bad digging a spoon in there…though I still would because it would be delicious! Love the picture. And such a great dessert – I haven’t made this in years. I need to get up off my lazy behind and do this again. Thanks for the inspiration. With berry topping it looks even more Delicious!!! i’m italian and i’ve never made panna cotta. you have inspired me to make it! Pede na po ba ung all purpose cream dito sa atin? yung liquid cream po ang gamitin niyo, yung nasa lata. 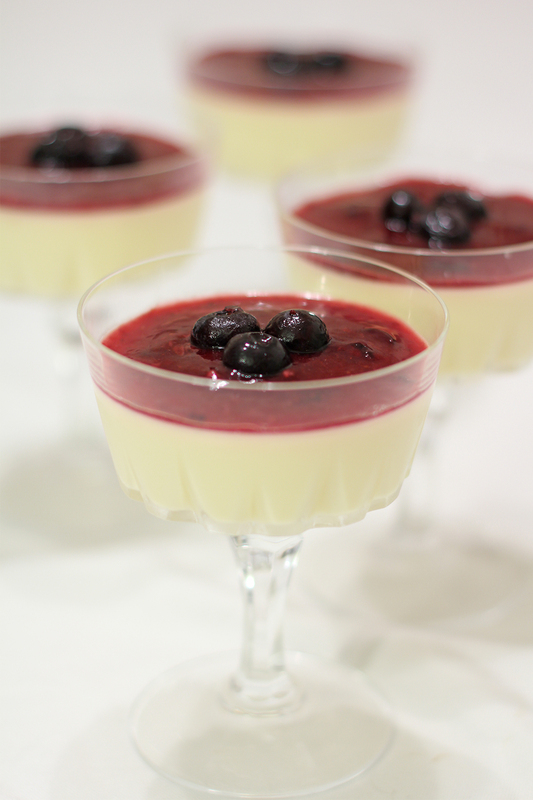 Agar agar will yield a different texture, panna cotta is supposed to be silky creamy texture.